'Step forward now, Soldier, How shall I deal with you? The soldier squared his shoulders and said, �No, Lord, I guess I ain't. Because those of us who carry guns, Can�t always be a saint. I've had to work most Sundays, and at times my talk was tough. And sometimes I've been violent, because the world is awfully rough. Though I worked a lot of overtime, when the bills got just too steep. And I never passed a cry for help, Though at times I shook with fear..
And sometimes, God, forgive me, I�ve wept unmanly tears. I know I don't deserve a place, among the people here. If you've a place for me here, Lord, It needn't be so grand. I never expected or had too much, but if you don't, I'll understand. As the Soldier waited quietly, for the judgment of his God. 'Step forward now, you Soldier, You've borne your burdens well. 'Praise the Lord,and pass the ammunition.' Soldiers often take a cynical view of religion; troopies teasingly call padres 'soulriffles'. Yet under combat pressure even the most hardbitten may feel the need for spiritual comfort. Chaplains like to recount a well-known story from the Great War. A soldier who insisted he was an atheist gave the chaplain a hard time. When the unit was ordered to move up to the front for a major offensive, the soldier approached the padre and asked him to say a prayer. 'Why do you, an atheist, ask me to pray?' asked the startled chaplain. 'Padre, there are no atheists in a trench,' came the frank reply. 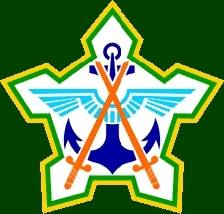 Spiritual awareness forms an integral part of the total preparedness programme of the South African Defence Force (SADF). 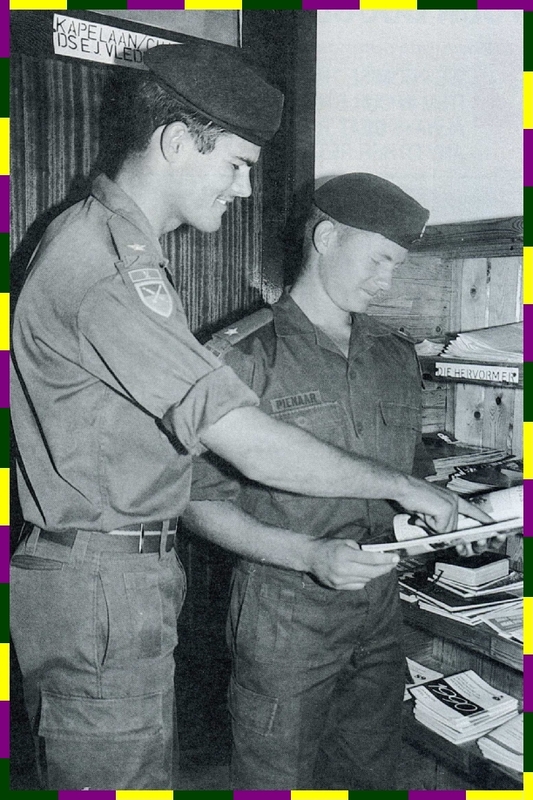 The aim of the South African Chaplain's Service is therefore to ensure that all members of the SADF are spiritually cared for by their denominations or religious body. * to manage the Chaplains' Service ef­fectively. 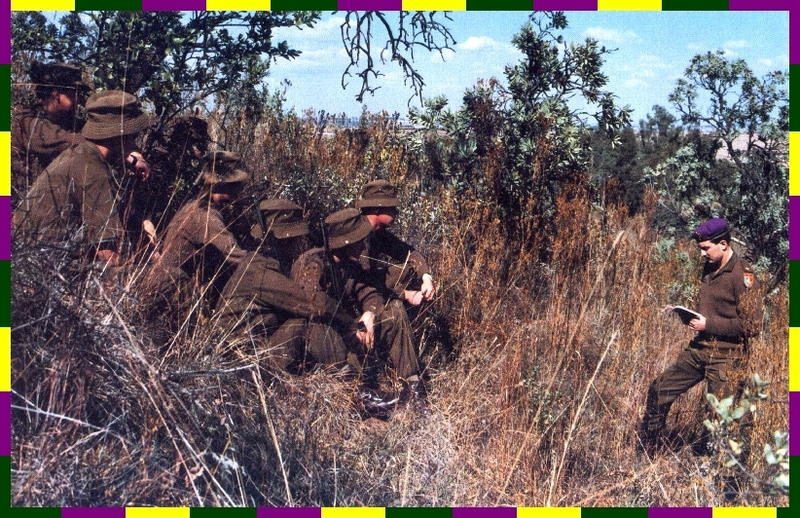 The rank of the Chaplain is unique and cannot be compared with any other rank in the SADF and the chaplain therefore wears a different type of rank insignia. 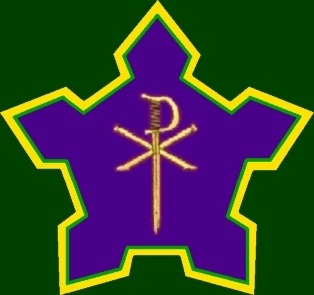 This is a gold or chrome Christ monogram mounted on a triangular purple background. The national service chaplains also wear a unique rank from March 1991 i.e. a small Maltese cross on a purple epoulette. Chaplains are always addressed according to their church or religious body's custom. The chaplain wears the uniform of the Arm of the Service to which he is attached. 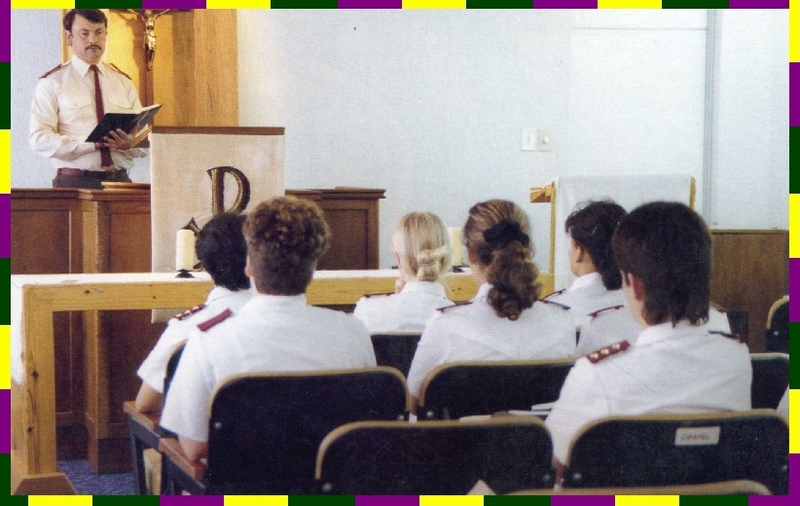 Ministers who have completed their theo­logical training and have been ordained, can be made available by their church or religious body for service in the SADF. The following categories exist: Permanent Force, National Service, Citizen Force and Commando Chap­lains. Geestelike weerbaarheid is 'n integrerende deel van die algehele weerbaarheid in die Suid-Afrikaanse Weermag (SAW). Daarom is die doel van die Suid-Afrikaanse Kapelaans-diens om te verseker dat almal in die SAW deur hul kerke/gelowe godsdienstig versorg kan word. * die Kapelaansdiens doelmatig te bestuur. Die rang Kapelaan is uniek en kan met geen ander rang in die SAW vergelyk word nie. Daarom dra die kapelaan ook 'n eiesoortige rangskenteken : 'n Christus-monogram wat in goud of chroom op 'n driehoekige pers agtergrond gemonteer is. Vanaf Maart 1991 dra die dienspligkapelaan ook 'n eiesoortige rangkenteken : 'n klein Maltese kruis op 'n pers epoulet. 'n Kapelaan word nooit op sy rang nie, maar volgens die gebruik van sy kerk aangespreek. 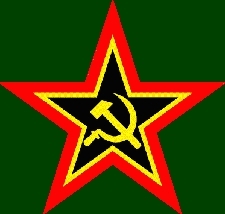 Verder dra die kapelaan die uniform van die Weermagsdeel waarby hy ingedeel is. Leraars wat hul teologiese opleiding voltooi en deur hul kerke of geloofsgenootskappe toegelaat of georden is, kan deur hulle kerke of geloofsgenootskappe vir diens in die SAW beskikbaar gestel word. Die volgende kategoriee bestaan: Staandemag, Diensplig, Burgermag en Kommando kapelane. "Where the soldier or the need is, there you will find the chaplain." The attitude of the chaplain iro the ministry is reflected in these words. The chaplain's ministry is directed in ac­cordance with the results of a scientific investigation undertaken by the Institute for Future Studies of the Potchefstroom University for Higher Christian Education. The pastoral care of every member is an essential element of his daily life and training. 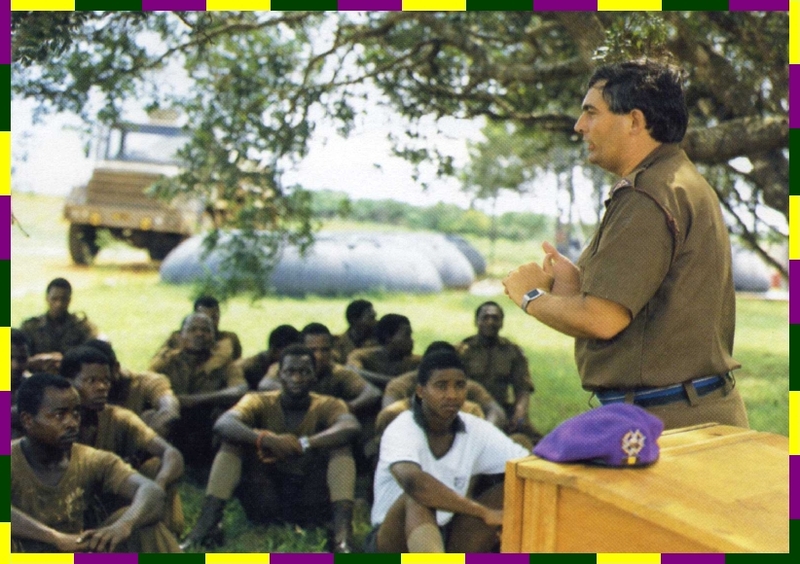 Every member of the SADF is thus granted the opportunity to practise his religion ac­cording to the creed and practise of his own church. This includes the attendance of church services and participation in other spiritual activities such as Bible study, youth evenings and catechism classes. The chaplain's ministry also extends to Marion and Gough islands and Sanae. The SADF Church Choir and Concert Group, the Canaries, has a close relationship with the Chaplain's Service. They perform their singing ministry countrywide and are also the main source of income for Bible distribution and the Coffee Bars. "Waar die soldaat of die nood is, daar is die kapelaan." Dit is die woorde wat die ingesteldheid van die kapelaan ten opsigte van die bediening weerspieel. 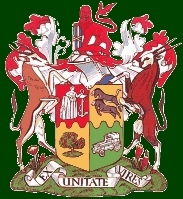 Die bediening van die kapelaan word gerig volgens die resultate van 'n wetenskaplike ondersoek deur die Instituut vir Toekoms studies aan die Potchefstroomse Universiteit vir Christelike Ho'e'r Onderwys. Die pastorale sorg van elke lid is 'n essensiele deel van sy daaglikse lewe en opleiding en daarom word alle lede van die SAW in die geleentheid gestel om volgens die leer en gebruike van sy kerk godsdienstig versorg te word. Dit sluit die bywoning van eredienste en deelname aan ander gemeentelike aktiwiteite soos Bybelstudie, jeugaande en kategese onderrig in. Die kapelaansbediening reik verder ook uit na lede wat op Marion en Gough eiland en Sanae werksaam is. Die SAW Koor en Konsertgroep, die Kanaries, het 'n noue verbintenis met die Kapelaans­diens in die sin dat hulle landswyd met hulle sangbediening optree en ook die hoofbron van inkomste vir Bybelverspreiding en die inrigting van koffiekamers is. In most cases the coffee bar has become the central point from which the chaplain carries out his ministry. Most coffee bars have both reading and writing facilities as well as a consulting room or office at which the chaplain may be consulted. The coffee bar has a homely atmosphere suitable for in-depth discussion or just peaceful relaxation and also serves as a spiritual home for Defence Force members. The Chaplain's Service endeavours to promote bible distribution and a special soft cover pocket edition of the New Testament and Psalms is supplied for use by members of the SA Defence Force. The distribution of literature includes study material for chaplains, brochures, pastoral aid and hymnbooks. This literature is provided in Afrikaans, English, North Sotho, South Sotho, Xhosa, Tswana and Zulu. A wide range of audiovisual programmes are also available for use by chaplains. Koffiekamers is in die meeste gevalle die middelpunt van waar die kapelane hulle hele bediening organiseer en uitvoer. Hier word in lees en skryfgeriewe voorsien en daar is meestal ook spreekkamer fasiliteite waar die kapelaan gespreek kan word. Die huislike atmosfeer van die koffiekamer waar menige diep gesprekke gevoer of sommer net rustig ontspan kan word, dien as geestelike tuiste vir die weermagslid. Die Kapelaansdiens beywer hulle vir Bybel­verspreiding en die Nuwe Testament en Psalms word spesiaal in 'n sagtebandsak formaat vir gebruik deur Weermagslede voorsien. Lektuurverspreiding deur die Kapelaansdiens behels onder andere beskikbaarstelling van die studiestukke vir kapelane, brosjures en pastorale hulpmiddels asook sangbundels. 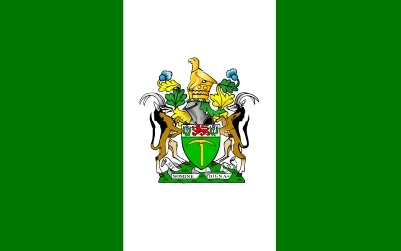 Hierdie lektuur word in Afrikaans, Engels, Noord-Sotho, Suid-Sotho, Xhosa, Tswana en Zoeloe voorsien. 'n Wye reeks oudiovisuele programme is ook reeds beskikbaar vir gebruik deur kapelane.